Objective: To organize Sankal se Siddhi New India Manthan programme To take pledge towards a clean, poverty, Corruption, terrorism, communalism, casteism free India and doubling agriculture income by 2022. To organize talk on seven point strategy for doubling farmers' income by 2022. KVK, Jhalawar organized Sankalp se Siddhi, New India Manthan (2017-2022) programme on 24 August, 2017. Sh. Dushyant Singh, Member of Parliament Baran-Jhalawar was Chief Guest of the programme and other guest were Sh. Narendra Nagar, MLA Khanpur, Sh. Ramchandra Sunariwal, MLA Dug, Sh. Kanwar Lal Meena, MLA Manoharthana, Smt. Teena Bheel, Zila Pramukh, Dr. Jitendra Kumar Soni, District Collector, Dr. K.M. Goutam, DEE, AU, Kota, Dr. L.K. Dashora, Dean, CH&F, Jhalawar. 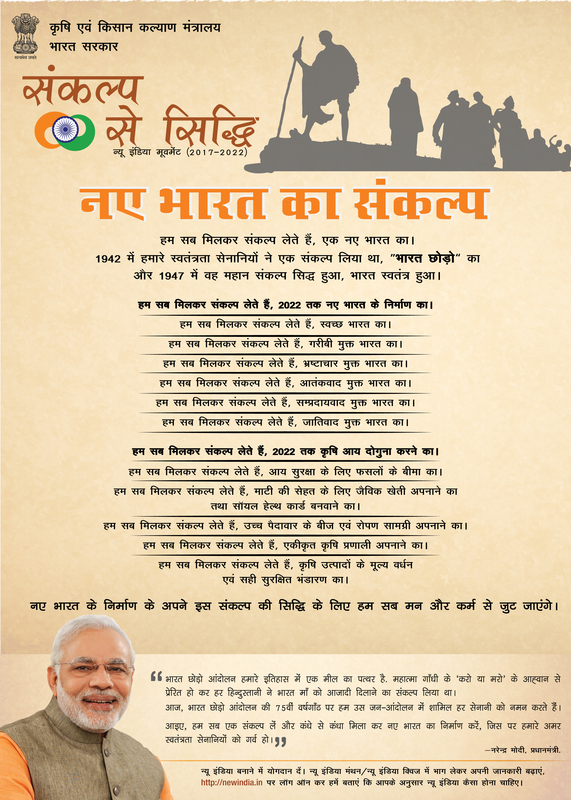 A Video message of Hon’ble Prime Minister on doubling the farmers' income was played. All the participants had taken the pledge towards a Clean, Poverty free, corruption free, terrorism free, communalism free, casteism free India and for doubling agriculture income by 2022. Talk on agricultural technologies was delivered by University experts. Chief Guest said that farmers should minimize the cost of cultivation by using proven technology. Total 1278 farmer, officials and public leaders were participated.